The Department of Intangible Cultural Heritage holds a conference on the study of discussing various problems concerning the conservation and passing on of intangible folk cultural properties every year. We held the fifth conference with the theme of “roles of museums and resource centers in protecting intangible folk cultural properties” at the seminar room of our Institute on November 18, 2010. While the activities of museums and resource centers have become diversified in recent years, there have been more and more examples of actively struggling to protect and pass on intangible folk cultural properties, regarding them as representatives of cultures in local communities. The conference asked four museums and resource centers nationwide to report on the current status and issues they face, and there was an active discussion based on those reports. 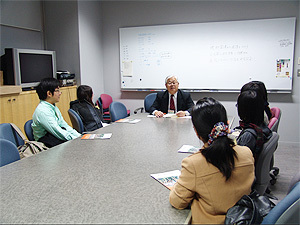 The details of the conference will be issued as a report in March 2011. The Center for Conservation Science and Restoration Techniques has been removing the wall paintings of Kitora Tumulus as part of a project called the Investigation on Conservation for special historic site Kitora Tumulus, commissioned by the Agency for Cultural Affairs. We had aimed to complete the removal in the next spring term following the intensive removal of the paintings in the spring and autumn of 2009. 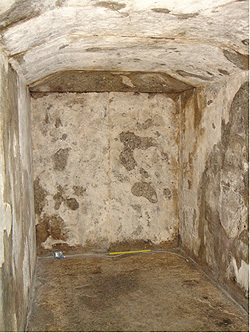 However, we removed all plaster from the stone chamber walls during this term earlier than the planned schedule (autumn 2010). This work was attributed to the proficiency of the engineers in removal, as well as to the development and improvement of the machines, tools and materials promoted by Tobunken. The work in the stone chamber was finished in a series of conservation projects of Kitora Tumulus Wall Paintings, starting with the removal of Seiryu (blue dragon) in 2004. 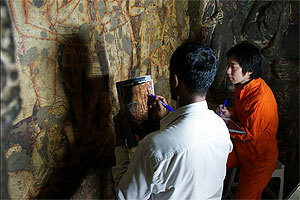 We will begin treating and mounting the wall paintings in the conservation facility. From October 3 to November 2, the Japan Center for International Cooperation in Conservation conducted the 9th Mission for Conservation of Wall Paintings in the National Museum of Antiquities of Tajikistan. This was part of the Exchange Program of International Cooperation of Cultural Heritage planned by the Agency for Cultural Affairs. During past missions, we examined the methods of mounting wall painting fragments on a support and decided on a basic policy. In this mission, we reviewed part of the operation process, aiming to further reduce the weight of support and shorten the operation time. In addition, we held a workshop entitled the Conservation of Wall Paintings from Central Asia 2010 at the above-mentioned museum from October 21 to the 27. At the third workshop during these missions the theme was mounting, which is the last process of wall painting conservation work. 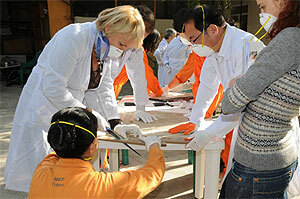 Five conservation specialists participated in the workshop: one conservator from both Kazakhstan and Turkmenistan in Central Asia, two conservators from the Mural Restoration Laboratories at the State Hermitage Museum, Russia, and one conservator from the Dun Huang Academy, China. Three trainees from the National Museum of Antiquities of Tajikistan also participated in the workshop. Using the mounting methods improved during this mission, all participants experienced all the processes of mounting wall painting fragments on a new support. 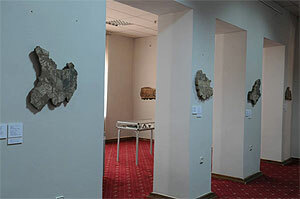 During the mission, we completed the conservation treatment of six wall painting fragments among those excavated from the Kala-i Kahkaha I site, and exhibited them at the above Tajik museum. Three trainees from the National Museum of Antiquities of Tajikistan learned methods for mounting wall painting fragments and the filling up of the lost portions on the surface of wall paintings. 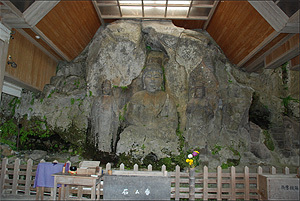 They were able to independently perform all conservation treatment processes. We hope that these trainees will continue conservation even after this project is completed. We also hope that they will contribute to the conservation of valuable cultural heritage in Tajikistan.